The transistor is the fundamental building block in all electronic devices. Since the early seventies the number of transistors in a silicon chip has grown from a few hundred to over two billion transistors on a single chip today. The exponential increase in demand for feature packed electronic devices is driving the semiconductor industry to produce chips that need to be smaller, more energy efficient and more cost effective than ever before. As a consequence transistors are becoming so small that conventional transistor architectures, used since the seventies, can no longer be used. Junctionless nanowire transistor successfully designed, simulated, fabricated and tested at Tyndall National Institute. "We have designed and fabricated the world s first junctionless transistor that significantly reduces power consumption and greatly simplifies the fabrication process of silicon chips," declared Tyndall's Professor Jean-Pierre Colinge. Current technologies require fabrication processes that are both complex and costly. All existing transistors are based on junctions. A junction is formed when two pieces of silicon with different polarities are placed side by side. Controlling the junction allows the current in the device to be turned on and off and it is the precise fabrication of this junction that determines the characteristics and quality of the transistor and is a major factor in the cost of production. Tyndall National Institute s ground breaking junctionless transistor doesn t require a junction. "The current flows in a very thin silicon wire and the flow of current is perfectly controlled by a `wedding ring` structure that electrically squeezes the silicon wire in the same way that you might stop the flow of water in a hose by squeezing it. 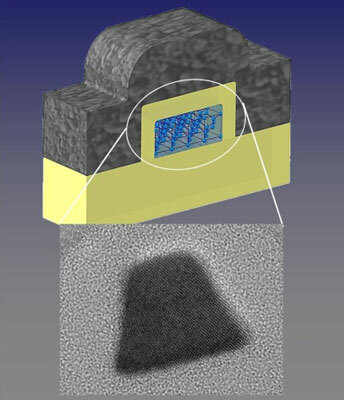 These structures are easy to fabricate even on a miniature scale which leads to the major breakthrough in potential cost reduction," explained Professor Colinge. Another key challenge for the semiconductor industry is reducing the power consumption of microchips. Minimising current leakage is one of the main challenges in today's complex transistors. "The Tyndall junctionless devices have near ideal electrical properties and behave like the most perfect transistors. Moreover, they have the potential of operating faster and using less energy than the conventional transistors used in today s microprocessors," said Professor Colinge. He went on to say that the junctionless transistor resembles in a way the first ideal transistor structure, proposed in 1925. But to-date, no-one had been able to fabricate it. He attributed the successful fabrication at Tyndall to the skill and expertise of researchers who were able to fabricate silicon nanowire with a diameter of a few dozen atoms using electron-beam writing techniques and expertise available at Tyndall. "We are very excited by the outstanding results that Jean-Pierre has achieved," commented Tyndall CEO, Professor Roger Whatmore. We are beginning to talk about these results with some of the world's leading semiconductor companies and are receiving a lot of interest in further development and possible licensing of the technology. These results could not have been achieved without the expertise of Jean-Pierre and his colleagues, funded by Science Foundation Ireland, and working in the state-of-the art facilities that we have at Tyndall. The work is also underpinned by substantial investments in Tyndall by the Department of Enterprise Trade and Employment and the Higher Education Authority. These world-leading results demonstrate the clear value of that investment in research and development. In a very short time Ireland is gaining recognition as a world leader in many technological areas and this investment needs to ensure Ireland's economic recovery," said Professor Whatmore.